IMPORTANT: This solution is supported on Microsoft Internet Explorer and Mozilla Firefox. It is not supported on Google Chrome. 1. Upload the image you will be using for your signature to a web location (I’ll use the one located here). 2. 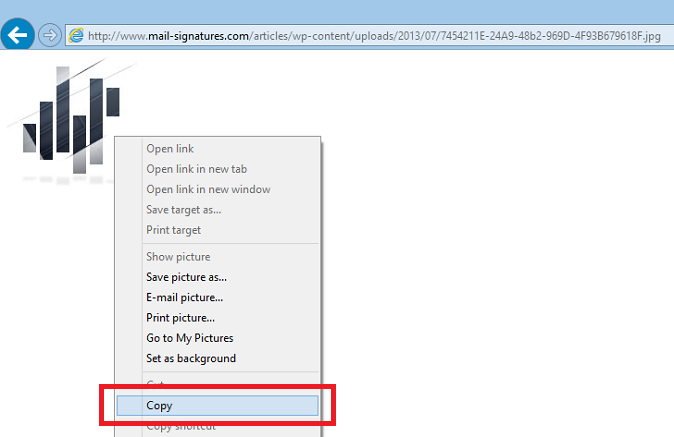 Open the web location, right-click the image and select Copy or a corresponding option in your browser (Fig. 1). Fig. 1. Copying an image using Internet Explorer. Other internet browsers use various names for the copy image option: Copy image (Firefox, Chrome), Copy image to clipboard (Opera), etc. This entry was posted in Microsoft Office 365 and tagged how to, hyperlink, insert image, office 365, tips on July 23, 2013 by Adam the 32-bit Aardvark.